Like classical block codes, a locally repairable code also obeys the Singleton-type bound (we call a locally repairable code optimal if it achieves the Singleton-type bound). In the breakthrough work of , several classes of optimal locally repairable codes were constructed via subcodes of Reed-Solomon codes. Thus, the lengths of the codes given in  are upper bounded by the code alphabet size q. Recently, it was proved through extension of construction in  that length of q-ary optimal locally repairable codes can be q &#x002B; 1 in . Surprisingly,  presented a few examples of q-ary optimal locally repairable codes of small distance and locality with code length achieving roughly q2. Very recently, it was further shown in  that there exist q-ary optimal locally repairable codes with length bigger than q&#x002B;1 and distance propotional to n. Thus, it becomes an interesting and challenging problem to construct new families of q-ary optimal locally repairable codes of length bigger than q &#x002B; 1. 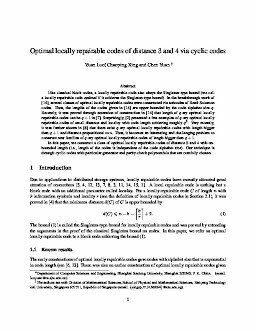 In this paper, we construct a class of optimal locally repairable codes of distance 3 and 4 with unbounded length (i.e., length of the codes is independent of the code alphabet size). Our technique is through cyclic codes with particular generator and parity-check polynomials that are carefully chosen.